This article describes step 2 of 4 of the South Asia Political Forecast project. The 4 step method is described in the previous post. In the first step, I discussed the baseline for the forecast, identifying the current state of democracy in South Asia. In this step, I draw from theory to identify factors that influence the strengthening of democracy in general. The baseline indicated strong support for democracy despite weak performance. But we cannot assume that democracy will continue by default. A significant share of the population is open to alternatives, such as “strong leaders” or “military rule”, even while they support democracy (Ref 1). So we need to find predictors of democratic strengthening. The most recent survey of South Asia, in this vein, found that formal education is the single biggest factor in determining support for democracy. “In South Asia, someone with a graduate degree is seven times more likely to support democracy than is a nonliterate person” (Ref 1, 92). Another strain of research focuses on cultural factors: History as a former British colony (as opposed to say, French colony) and penetration of the English language have been correlated with democratic viability. Diversity may also help, especially because minorities in any given area are stronger promoters of democracy. In addition, we need to consider spillovers from international terrorism, American foreign policy, and, very significantly, climate change. All these influences on democratic strengthening are derived from theory and past data, which are predictors but do not form a forecast. The next step is to organize these predictors to form a forecast, in which variables are prioritized by risk. In doing so, the next post will introduce relative certainties and uncertainties. Note: I’m using these posts to summarize my lengthier analysis. The references below reflect only this summary. Ref 1. deSouza, Peter R., Suhas Palshikar, and Yogendra Yadav. “The Democracy Barometers: Surveying South Asia.” Journal of Democracy 19/1 (January 2008): 84-96. Define baseline: What is the current state of democracy in South Asia? Detect first-order trends: What factors influence (drawing from theory) the strengthening of democracy in general? Identify certainties and uncertainties: Which of these factors are relatively certain to exist in fifty years? Which of these are uncertain? Construct scenarios: What are the likely combinations of the main certainties and uncertainties? What are the risks and implications? In this post, I will highlight some aspects of the baseline that I constructed for the report. Later posts will discuss subsequent steps. Democracy is common and understood well as a system. In the past fifty years, the common platform across South Asia has been a Westminster-style parliamentary system. Challenges to this, either presidential (in Pakistan, Sri Lanka, and Maldives), or military-autocratic (Bangladesh and Pakistan), or one-party rule (India and Maldives) have been temporary, which eventually gave way. Even monarchies (Nepal and Bhutan) have begun to move toward greater parliamentary legislation. 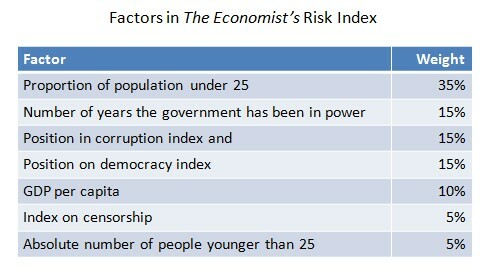 Governance is weak; political risks are high. The violation of civil and political liberties is widespread across the region. Corruption is common: South Asian countries have consistently ranked in the bottom half in the world’s corruption indices. Insurgency is significant: Af-Pak frontiers, Kashmir, Nepal, Sri Lanka (until recently), Bangladesh’s southeast, the Indian northeast, and more than a third of the rest of India. Terrorism has increased since the late 1990s. The states of South Asia have built large security forces, which makes civilian political leadership uncomfortable. Political organization varies greatly. Political parties are organized to varying degrees of success, and often fall prey to cults of personality. Dynastic influence is high across the region. Most political parties are run in an authoritarian fashion. Some major parties are affiliated, directly or indirectly, with armed cadres to enforce strikes and carry out political violence. Mass support for democracy is strong. Despite weak performance, citizens across South Asia voice strong support for democracy, according to most surveys conducted in the last two decades. The most recent region-wide survey shows that South Asians overwhelmingly favor the rule of “leaders elected by the people.” It reported that “For every one South Asian response that endorses dictatorship, there are six South Asian responses that prefer democracy” (deSouza et al 2008, 86). However, South Asians want to modify their democracy with stronger leadership, greater discipline, and greater respect for traditional values. This is an important point we will come back to at the end of the forecast. Stay tuned for the next installment: first-order trends. Cited reference: deSouza, Peter R., Suhas Palshikar, and Yogendra Yadav. “The Democracy Barometers: Surveying South Asia.” Journal of Democracy 19/1 (January 2008): 84-96. This paper summarizes the results of a large-N survey across South Asia.